What makes Wine Embassy unique? 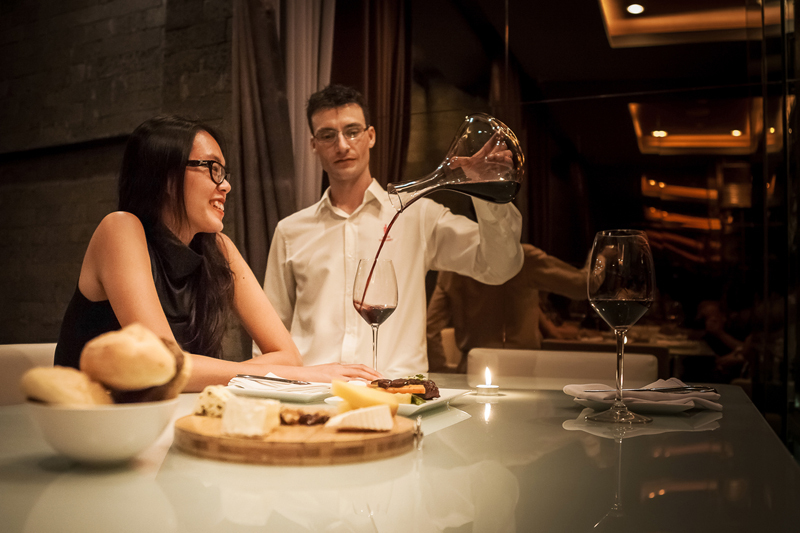 Francois Carteau: We have brought wine accessibility to a new level in Vietnam – more choices by the glass, monthly updates, group wine tastings and we are the only wine bar using a wine dispenser. The wine dispenser can preserve an opened bottle for two weeks or longer, keeping it in perfect drinking condition, thus allowing me to recommend more wines by the glass, unlike anywhere else. Customers buy a prepaid card and can then sample our selection, along with suggestions for tapas pairing, on their own or guided by our staff. The card also offers customers special promotions and keeps track of what they poured and their favorites. Pours are dispensed in three different glass sizes: 4cl, 9cl and 12.5cl. In November, for our second anniversary, we’ll be holding a lottery where customers who use their wine card stand a chance to win prizes like a Champagne bottle, a dinner for two, a free training course and more. What different labels and price points of Ugarte wine do you stock? And can you name some dishes that will pair well with them? FC: At Wine Embassy Boutique (www.en.wineembassy.vn) we sell the basic range of Reinares red and white in our “Below VND350,000” range, the Mercedes Egunon red and white at VND505,000, Ugarte Rioja Crianza at VND625,000 and the Ugarte Rioja Reserva at VND880,000. Rainares is easy drinking so perfect as a starter by itself, with salad or cold cuts. Mercedes Egunon red is more intense, powerful with firm tannins and a great balance that goes well with oven-baked red meat and roasted vegetables. Ugarte Crianza and Reserva are my favorites; pair them with a simple Australian ribeye steak with potatoes sautéed with wild mushroom and a bit of fresh ground red pepper from Phuc Quoc. The particularity of the Ugarte wine range is their excellent value dimension. From great friendly wine to classic and well structured, I find it a beautiful addition to the Spanish selection in Vietnam. Tell us more about your wine training courses. FC: The wine training courses give people an opportunity to learn more about wine. 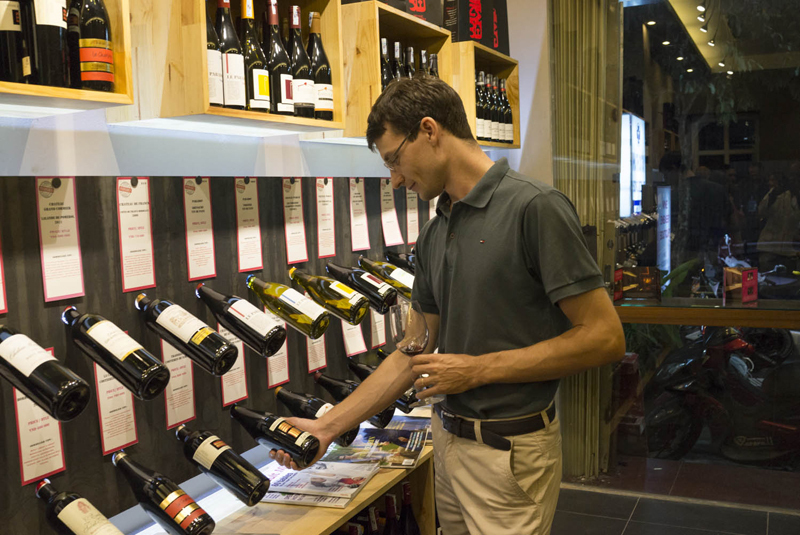 For the novice, I suggest going to a weekly training class first (every Tuesday 6pm to 7pm) where you can chose one of three topics and spend a fun hour learning and tasting four wines, and at VND490,000 per person for one session it’s also a great deal. We also have a monthly training program for serious learners. The package includes four sessions (a two-hour class once a week) and covers all aspects from the basics, Old versus New World, tasting and food matching. The cost is VND3,990,000 per person. At this stage, regular trainings are done in English, but Vietnamese versions are coming soon. Can customers book a course at home? FC: Yes, with a minimum of eight people. Nothing’s better than learning with your best friends in the comfort of your home. By customizing a menu to each client I can match all the wines within their budget and also be there to explain the pairing if needed. Think about it. The holiday season is coming! Can you explain more about your blending wine workshop? FC: We recently had a blending wine workshop where everyone was given two white and three red wines and we practiced blending like winemakers do. Using a measurement cylinder, it brings a lot of fun for everyone as they end up creating their perfect wine, like building your own wine. We will organize it again but can also offer it as a private workshop at home. Describe the difference between the Wine Embassy Boutique in District 2 and the Wine Embassy Bar in District 1. FC: Wine Embassy Bar (13 Ngo Duc Ke, D1) is a real wine bar with a large selection of 24 fine wines by the glass that hosts regular events, corporate and private tastings. 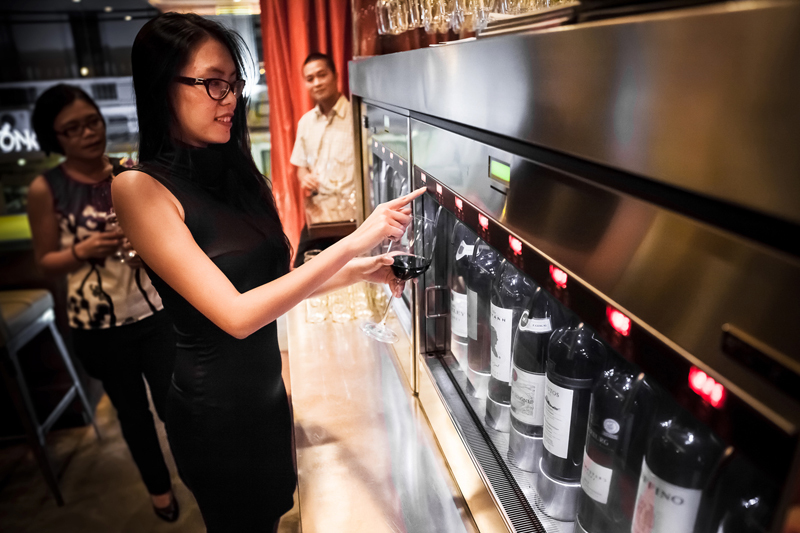 Here, our guests can enjoy a full wine experience such as discovering new wines from our monthly updated list using our unique wine dispenser card system, combined with professional customer service and state-ofthe-art equipment. distinct, authentic ones from France, Italy, Spain, Chile, Argentina, the US and Australia. Regular tastings are organized and some training courses are also available. At the boutique we offer convenience by having chilled bottles ready to go for last minute dinner plans (delivery until 8:30pm) and predinner packages (cold cuts, cheese box and wine) for get-togethers.